We offer 1 and 3 day Emergency First Aid at Work, 2 Day Paediatric First Aid Manual Handling Training, Fire Warden Training Food Safety and CITB. The QA Level 3 Award in First Aid at Work (RQF) qualification is specifically designed for individuals who wish to act as a first aider in their workplace. Recommended for all industry sectors were a nominated first aider/s is required in the workplace. Successful candidates will learn how to manage a range of injuries and illnesses that could occur at work and will be equipped with the essential skills needed to give emergency first aid. Employers can book this course for their employees and rest assured that they have fulfilled their legal responsibilities for providing quality first aid training, without having to undertake any lengthy due diligence checks introduced in the recent HSE changes. Call Janine or Mark on 0151 515 0416 for further details and bookings. 1 Day Emergency First Aid Training - In House. Designed to cover essential first aid skills of smaller workplaces. Ideal for those who work in lower risk workplaces including staff working in offices, teachers and staff, retail shops, hotels and most public working areas. Emergency First Aid at Work (RQF) Level 3 Award qualification is designed for individuals who wish to act as an emergency first aider in their workplace. Upon successful completion of this Emergency First Aid at Work qualification, candidates will be equipped with the essential skills needed to give safe, prompt and effective first aid in emergency situations. What's more, as a regulated qualification, employers can book this course for their employees and rest assured that they have fulfilled their legal responsibilities for providing quality first aid training, without having to undertake any lengthy due diligence checks introduced in the recent HSE changes. We can deliver this Emergency First Aid at Work course on-site at your place of work to a group of up to 6 – 10 staff for only £425.00. Delivered directly in your workplace anywhere in Liverpool, across Merseyside and the Northwest. Call Janine or Mark on 0151 515 0416 for further details and booking. CITB Health and Safety Awareness training – the first step to obtain your CSCS Green Labourers Card. 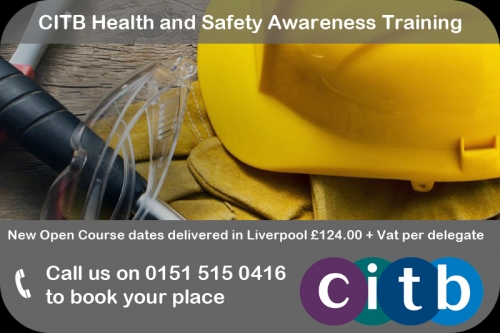 The CITB Health and Safety awareness (HAS) course can be taken in the preparation for the CITB Construction Skills Health, Safety & Environment test (CSCS) or as refresher training for operatives in any construction or building sector. This Site Safety Plus course is a popular route for anyone looking to take their first step towards obtaining a CSCS Labourers (Green) Card. Did you know that we offer both the CITB Health and Safety awareness training and the Health, Safety and Environment Touch Screen test on the same day? The combined cost for both is £154.00 + Vat (£184.80). Did you know that we can also deliver the Fire Warden Training with Fire Extinguisher demonstration? The Fire Warden Training with Fire Extinguisher demonstration will be subject to access to an open area and provides you the basic skills and knowledge for ‘hands on use' of a fire extinguisher. The Fire Warden training with Fire Extinguisher demonstration extends the training from the classroom to an open area which will engage the delegates. Although we do not train in a ‘live Fire' scenario it is beneficial that staff have a good practical demonstration in discharging the equipment and having hands on experience in an outdoor environment. A group booking for up to 6-10 delegates for Fire Warden Training with Fire Extinguisher demonstration is only £465.00 +Vat. Manual Handling training is for everyone who carries out manual handling tasks in the course of their work. This includes Office staff who may have manual handling activities of a low risk to healthcare Staff and warehouse operatives who have a higher risk of sustaining injury from Manual handling activities. This course can be delivered in your workplace anywhere in Liverpool for up to 12 delegates. This Manual Handling training meets the requirements of the MHOR Regulations 1992 and is valid for 3 years. Half Day (4 hours) We are flexible with starting times to meet the needs of your business. To provide delegates with a thorough understanding of how to minimise the risk of injury to themselves and others by increasing awareness of potential manual handling hazards and their outcomes while carrying out duties in their workplace. This two day course is suitable for school staff, child minders, nursery assistants and staff who look after children as part of their working requirements. It will be of particular interest to Child Minders, Teachers, Crèche Assistants and staff who have a responsibility for children whilst in their care. This 2 Day Paediatric First Aid course can be delivered directly in your workplace for 6-10 delegates for only £690.00 +Vat. Delivered in Liverpool, Manchester and across North Wales. Call Janine or Mark on 0151 515 0416 for further details on our 2 Day Paediatric First Aid ‘Open Courses' in Liverpool or to secure your first aid course. You can be assured that you are meeting your First Aid Training requirements by attending this Paediatric First Aid Course which is Ofqual regulated. The Cost for the ‘Open Course' per delegate is only £105.00 +Vat. Offers in house and open Courses.1 day ideal for lower risk work places ; 3 day for industrial. school : : 2 day Paediactric suitable staff, child minders & nursery workers. Call Janine or Mark on 0151 515 0416 for further details and booking.